It is Trinity Sunday. If you went to church today, you know that. Preachers around the world struggled to write sermons on a near-impossible topic. We like this explanation by Andy Walton that was published in Christian Today a couple of years ago. Read it; this way we don't have to write about Trinity Sunday, which would be difficult. We (the various people, mostly uncredited, who write here for Anglicans Online), live in non-rural areas of wealthy countries. That means that more and more we are surrounded by, and occasionally ridiculed by, non-believers and certainly non-Anglicans. From time to time we find ourselves challenged to explain or justify our faith, our Anglican Christian beliefs. Recently a volcano has been erupting in Hawaii*. You know this, because the eruption has been covered by every international news publication, with dramatic pictures of beauty and destruction. In past millennia, volcanoes and earthquakes and storms and eclipses were understood by frightened people to be supernatural in origin. The Polynesians who settled in Hawaii at about the time the Gospel of John was being written certainly believed in volcano gods. For them the notion of 'forces of nature' was incomprehensible. Volcanoes were the work of Pele, goddess of fire, volcanoes, lightning, and wind. In these modern times, we are encouraged to find rational and scientific explanations for phenomena that were once thought to be supernatural. No fire gods for us. No person or test instrument or measuring device has ever explored a volcano, but we are offered sound scientific explanations† for the creation and behaviour of volcanoes. The Bishop of Hawaii has said that there are no Anglicans or Anglican churches endangered by this current eruption, so why are we taking note? Well, it is Trinity Sunday, on which we are reminded each year that God is in three persons. We sing hymns about it and listen to sermons about it. What if somehow one of those persons embodies Pele? What if ...? It has sometimes felt odd to shrug off indigenous belief in a fire god as primitive and pagan while admitting of a Holy Spirit often depicted with flame. Our non-believing urban neighbours and colleagues look at our belief in the Holy Trinity the same way that we might look at an islander's belief in Pele the fire god. Scorn for belief in the unverifiable is widespread, especially in this era when the very word 'truth' is being twisted. Every week in church we say the creed. We say out loud the things that we believe. The Apostles' Creed begins with the sentence 'I believe in God, the Father almighty, creator of heaven and earth.' The Nicene Creed is similar. If we don't believe it, subject to what the word 'creator' means, we shouldn't be saying it, or we should be crossing our fingers. 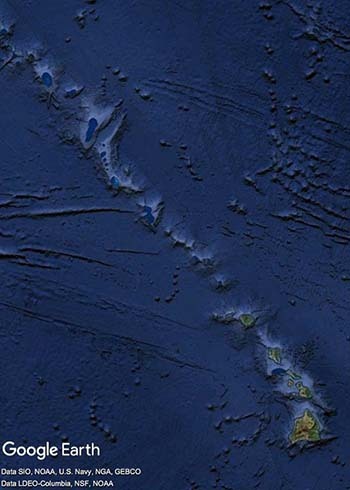 We asked a non-believer for an explanation of how Hawaii was created, and why it has the shape it has (see the image at the left), and why only its largest and southernmost island has volcanoes erupting now. She, of course, had no better idea than we do, but our faith that there is a divine plan (even if we don't know what it is) feels more solid than her faith in 'random forces of nature'. We don't really know what the words 'random' and 'nature' mean, either. But we can say 'I believe in one God the Father Almighty, Maker of heaven and earth, and of all things visible and invisible' and mean it proudly. There is no requirement that we understand it, after all. 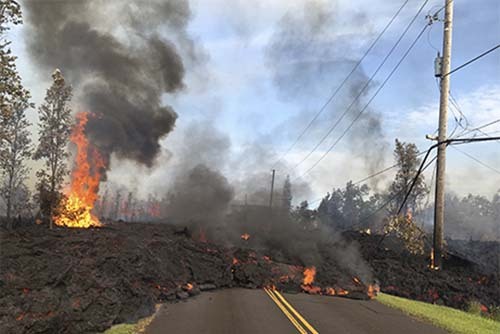 †We are told "Research by scientists at the Hawaiian Volcano Observatory makes Kīlauea one of the best understood volcanoes in the world, shedding light on the birth of the Hawaiian Islands and the beginnings of planet Earth. Each eruption is a reminder of the power of natural processes."